I did some research when I bought a kitchen electric slicer…around here it’s easy to buy VERY expensive, hard-to-clean commercial models…they are sold anywhere hunter’s shop…to process venison. I had quite a bit of experience with them when I worked as a dietitian…but I wanted something I could store in my kitchen and use regularly for slicing bread and cooked roasts and ham. I finally settled on a Chef’s Choice 632 by Graef, for about $300 in 2014. It’s relatively easy to clean, the blades are available on Amazon, and it’s lightweight enough for me to keep in a storage cabinet near my kitchen and still carry it to the counter to use. It’s wonderful for slicing bread…even, consistent slices…you just have to have your bread at room temperature, not just out of the oven. However, that’s true no matter how I slice it. I always chill quick breads overnight, tightly wrapped, before slicing, and they slice beautifully! Again, that is what I do no matter how I slice it. Meats slice well too…I can buy better quality ham, for instance, than I can buy pre-sliced, and I don’t have to pay to have it sliced. I chill any cooked roasts, like beef roast or pork loin overnight and slice it for lunch meat or thicker to reheat with gravy for super-quick meals. I usually place a tray under the drop-zone to catch any juices or crumbs and make clean-up even easier. A small one comes with it. I freeze all my sliced bread and cooked roasts so we can dole it out over time. I keep a “bread box” plastic drawer in my kitchen freezer, and baskets of ham and cooked meat meals in my big freezer. This machine will not slice cheese as well as a deli slicer…it just doesn’t have the power…but it’s not something I slice regularly anyway. I keep a chart inside the door of the upper cabinet where I use it with the settings listed for the items I usually slice. My husband thinks it’s great, and usually willingly volunteers to slice meat or bread for me. He agrees with me…we would buy another if something happened to this one. **They haven't paid us to review this machine. Sue and John just sliced a Frick's Smoked Hog Jowl bacon for me with this slicer, really really nice even slices just the thickness I wanted. Many years ago I had a manuel slicer but this is way better. If you are in the market for a slicer this sure is one I would look at buying. 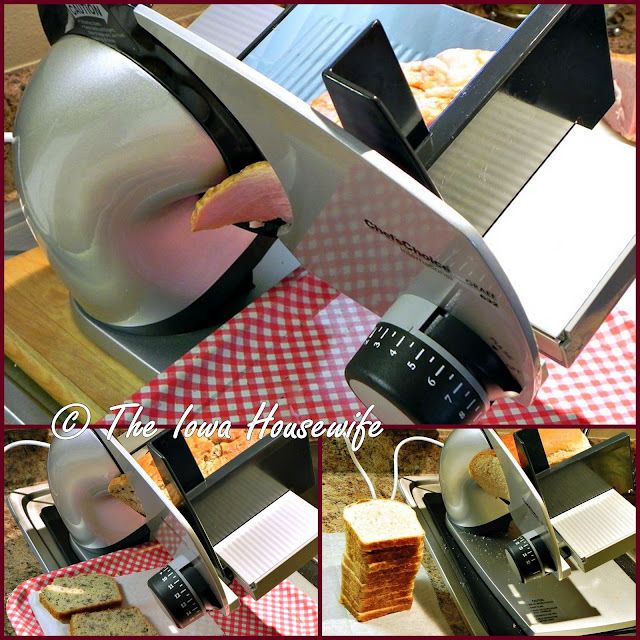 I've never thought about using one to slice bread. Great idea.